Summary: Thirteen year-old Alex is a kid with a lot on his plate. His father is physically and emotionally abusive, his little brother Tobey has cancer, and at school Alex is being bullied. As everything piles up Alex finds a way to vent by writing letters to Graham, telling him what’s going on and how he’s dealing with it. When Tobey’s cancer gets worse and Alex’s grandmother has an accident of her own, it feels like home life is a pressure cooker. One wrong move can aggravate and invoke his father’s anger, and Alex is beginning to realise he and his mother and siblings can’t live with the dragon anymore. Review: Other than being a bit confused by who Graham was at first, I quickly realised the story was not about who Alex was writing to, but about Alex’s letters themselves. Through opening up in his writing, Alex is able to explore the difficult aspects of his life. He’s quite independent in that respect, as his self-reflection helps him to cope. What I like most about this book is Tobey. I like him as a character, but what I also appreciated is how his cancer storyline opens things up for Alex. Dealing with his brother’s terminal illness helps him and his family determine what they will and will not put up with. As Tobey’s cancer gets worse, the family’s capacity to deal with having to walk on eggshells around their father is reduced. It’s all too much, especially when paired with the grandmother’s injury, and comes to be a catalyst for getting the ‘dragon’ out of their lives. Of course there are other factors like Margie being on the receiving end of their father’s violence, but in the end everything seems to work together. And as a result, there is hope. The dragons in their lives are expelled, one in a tragic manner and the other by being vanquished. Alex grows from essentially wanting to be someone else to making good friends and finding activities he loves and is good at. It’s clear he’s going to be okay, which is reassuring. I like it as a read for pre-teen to early teen readers. “I wiggled my bulky form under the bed until my fingers nudged a mound of slippery, uncrinkled paper. I pulled it out. I flopped the red parcel over. No scotch tape. It rolled and unrolled into a toque with matching mittens and a label: ‘To Alex, From Santa’. In my mother’s handwriting. My head swooshed. My ears clanged. A sudden cool breath of air hit me. Someone had opened the front door. I gave the present one quick shove under the bed and ran. In the bathroom I unzipped my jacket, pulled down my snow pants and sat. And sat. My heart and head thudded. Now I knew things about Santa other kids did’t know. Maybe not things I wanted to know. I also knew I couldn’t tell anyone. 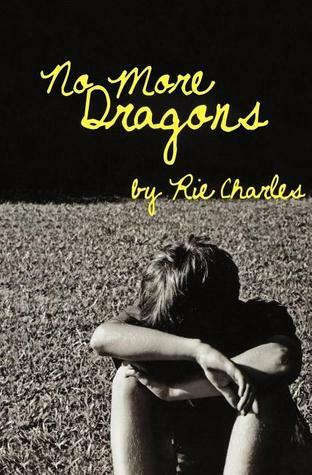 No More Dragons by Rie Charles is published by Napoleon Publishing, (2010).